Q switched lasers are the current gold standard for laser tattoo removal. Though these systems are generally quite effective in clearing tattoos & have an established safety record, certain limitations exist while following the standard protocol. To overcome these limitation newer techniques such as multipass method, combination treatments with chemical agent and other laser have been introduced. These methods help in faster, less painful and complication free tattoo removal. Q switched lasers are the current gold standard for laser tattoo removal. Though these systems are generally quite effective in clearing tattoos and have an established safety record, certain limitations exist while following the standard protocol. Until now, multiple sessions spaced over a period of time have been the protocol for laser tattoo removal. The limitations of this include : Incomplete clearance, long total treatment duration with the large interval between sessions, ink retention despite multiple sessions, treatment-associated side effects such as blistering and dyschromia. Attempts have been made to overcome these shortcomings by modifying the technique or combining multiple lasers to achieve optimal results and minimize adverse effects. Tattoos consist of thousands of large particles of pigment suspended in the skin. Laser tattoo removal is based on successful application of the theory of selective photothermolysis. Q switched laser delivers energy in an ultra-short duration, typically in nanosecond range with very high peak power. This energy is then selectively absorbed by tattoo ink because of its preferential wavelength and thermal relaxation time. The rapid heating of melanosomes converts cytoplasmic water into steam, which results in intracytoplasmic vacuole formation. The current trends and techniques in laser tattoo removal have attempted to reduce the total number of sessions needed, to shorten the total duration of time required to achieve clearing of tattoos and also to minimize adverse effects. Some of these techniques are described in the following sections. Frosting created by application of Q switched laser prevents penetration of further laser light in the dermis. If we wait for sometime the frosting usually subsides and laser can penetrate again. Using this principle, Kossida et al. used a novel technique in which they delivered four laser passes in a single session, after waiting for 20 min between each pass (R20 method). They reported higher efficacy of this method at the end of 3 months in tattoo clearance when compared to standard method. Bunert et al. showed similar results in professional tattoos  and Zawar et al. in amateur tattoo  [Figure 1]. The exact mechanism of action is not known. It was postulated that the after subsidence of frosting if we deliver laser, then it can penetrate deeper in the dermis thus targeting more dermal ink. It can also fragment the ink particle into smaller pieces thus allowing faster clearance of ink by macrophages. There are many advantages of R20 methods. It is more effective than traditional method. The number of sessions required for tattoo removal is greatly reduced thus decreasing the number of visits to the clinic and increasing patient compliance. The original studies showed that it is not only more effective but also safe in most of the patients. The disadvantages are one single session can take 3½ h. to 4 h. to complete thus requires long waiting in clinic. It also can require multiple R20 sessions to eliminate the ink completely, which still may not be possible. 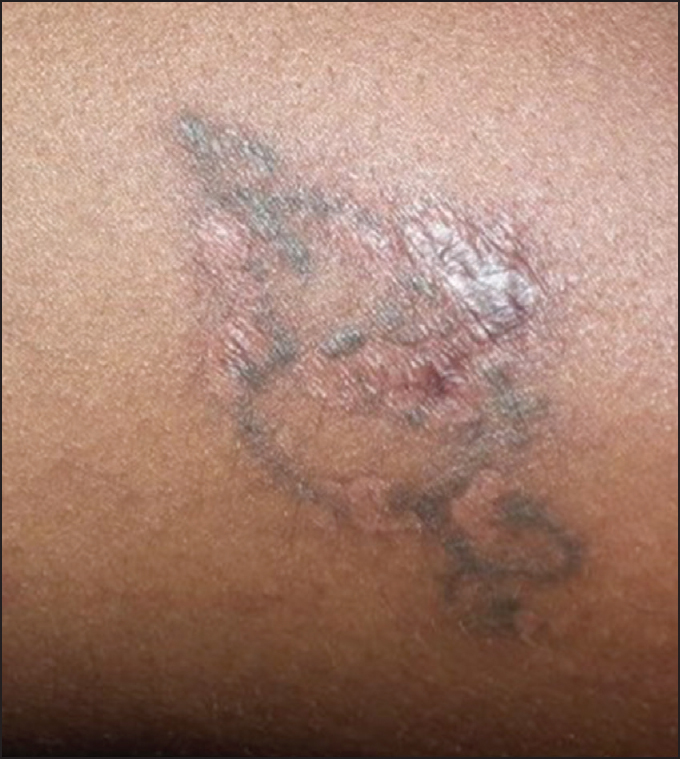 Although reported safe in type 1-4 skin, in pigmented skin the overall incidence of blistering, scarring, and pigmentary alteration can be more [Figure 2]. As mentioned earlier, the frosting observed during tattoo removal is because of release of gas bubbles in stratum corneum. Perflurodecaline is a liquid perflurocarbon. These are colorless, inert compounds with low surface tension and insoluble in blood and water. They have high gas solubility and high optical clarity. This compound is extensively studied in medical applications including as a blood substitute due to oxygen-and carbon dioxide-gas carrying capacities, and Food and Drug Administration-approved use as an ophthalmologic vitreous body replacement. PFD is widely used in ophthalmology and is easily available in ophthalmic pharmacies. It is commercially available as a Zero W spray. Reddy et al. compared R0 and R20 methods and reported that the R0 method is as effective as R20 method with a reduced treatment time of 5 min  [Figure 3]. Imiquimod is a topical immune response modulator. Topical application of imiquimod alone is known to fade the tattoos to some extent when applied immediately after tattooing. Based on this finding, it was postulated that imiquimod interferes with tattoo pigment phagocytosis and prevents tattoo maturation. Application of laser recreates the biological scene similar to early tattoos. Wherein most of the tattoo pigmented lies freely in the tissue. Thus, it was postulated that combining Imiquimod with a laser could increase the efficacy of both modalities. Elsaie et al . evaluated imiquimod and QSYL in the treatment of tattoos and reported more favorable outcome in the tattoos treatment with combination than tattoos treated alone or with placebo. However, Ricotti et al. studied 20 patients with daily application of imiquimod cream and 4-6 weekly application of QSYL for five session and reported imiquimod as ineffective combination. Furthermore they also reported more complications on imiquimod treated site. Based on the limited studies, the use of imiquimod in combination with QSL remains controversial as of now. Murphy reported a simple and novel technique to reduce the pain and decrease epidermal damage during laser tattoo removal. The technique consists of application of a glass microscope slide firmly on the treatment area. This applied pressure results in evacuating the blood from capillary plexus. The laser pulse is then applied through the glass slide. Light scattering properties of skin and hemoglobin prevent effective penetration of the laser into the skin, which ultimately reduces its clinical efficacy in clearance of deeper tattoos. This becomes more problematic when one tries to remove the colored tattoos since shorter wavelengths are used to treat them. These shorter wavelengths have limited penetration depth. The pigment in this microsphere can easily targeted using a pigment specific wavelength. This will result in breakage of microspheres and exposing the ink to the body's defense mechanism. In an unpublished data Klitzman et al. demonstrated 80% clearance of tattoo in a single session using microencapsulated tattoo ink in guinea pig and hairless rats. Although promising modality for faster tattoo removal, there are no published data in humans and its safety and efficacy needs further evaluation. Recently one such brand is available in United States as the Infinitink ® (Freedom Ink, USA). Current QYL laser has pulse duration in nanosecond [10−12 s]. If we narrow down the pulse duration, furthermore, the peak energy of the laser beam becomes very high. This results in more rapid heating of the tattoos and finer fragmentation. The lymphatic elimination of these finer particles is easier resulting in faster clearing of the tattoos. The picosecond lasers with pulse durations in the range of 50-100 picosecond were introduced commercially in the early part of 2013. At present, we have 3 or more systems with a wavelength of 755 nm and 1064 nm and pulse duration of 50-100 picoseconds. Although effective and safe in white skin, their safety remains to be evaluated in pigmented skin. Furthermore, their present exorbitant cost makes them less attractive option in our scenario. Monotherapy with QSL is often effective for tattoo removal but combining QS laser with an ablative fractional laser or nonablative fractional laser may yield faster clearing, minimize number of sessions, and reduces side effects. The combination can be in any order; FL followed by QSL helps reduces blister formation. Au et al. analyzed  the incidence of bulla formation after tattoo treatment using the combination of the picosecond Alexandrite laser and a fractionated CO 2 laser ablation. In their study, 32% of patients treated with the picoseconds laser alone experienced blistering, whereas none of the patients treated with the combination developed blistering. The study showed a statistically significant decrease in bulla formation associated with tattoo treatment when fractionated CO 2 ablation was added to the picosecond alexandrite laser. These studies suggest a shift in paradigm in laser tattoo treatments demonstrating the benefits of the combination over QSL alone. QS lasers have established themselves as the mainstay of therapy for tattoo removal. With the aim of improving outcomes and enhancing the speed of clearance, newer techniques, and modifications have been proposed that seem to deliver the results. Evolution in technology with the commercial availability of picosecond lasers has opened the doors to targeting tattoo pigments that were hitherto difficult to treat. These techniques and the development of laser responsive tattoo inks may pave the way to more efficient and safe tattoo removal in the future. Ho DD, London R, Zimmerman GB, Young DA. Laser-tattoo removal - A study of the mechanism and the optimal treatment strategy via computer simulations. Lasers Surg Med 2002;30:389-97. Kossida T, Rigopoulos D, Katsambas A, Anderson RR. Optimal tattoo removal in a single laser session based on the method of repeated exposures. J Am Acad Dermatol 2012;66:271-7. Bunert N, Homey B, Gerber PA. Successful treatment of a professional tattoo with the R20 method. Hautarzt 2014;65:853-5. Zawar V, Sarda A, De A. Bindi tattoo on forehead : Success with modified R-20 technique using low fluence Q-switched Nd Yag laser : A case report. J Cutan Aesthet Surg 2014;7:54-5. Reddy KK, Brauer JA, Anolik R, Bernstein L, Brightman L, Hale E, et al. Topical perfluorodecalin resolves immediate whitening reactions and allows rapid effective multiple pass treatment of tattoos. Lasers Surg Med 2013;45:76-80. Littlejohn GR, Gouveia JD, Edner C, Smirnoff N, Love J. Perfluorodecalin enhances in vivo confocal microscopy resolution of Arabidopsis thaliana mesophyll. New Phytol 2010;186:1018-25. Fox MA, Diven DG, Sra K, Boretsky A, Poonawalla T, Readinger A, et al. Dermal scatter reduction in human skin : A method using controlled application of glycerol. Lasers Surg Med 2009;41:251-5. Azzolini C, Brancato R, Trabucchi G, Camesasca F, Codenotti M, Verdi M. Endophotocoagulation through perfluorodecalin in rabbit eyes. Int Ophthalmol 1994;18:33-6. Elsaie ML, Nouri K, Vejjabhinanta V, Rivas MP, Villafradez-Diaz LM, Martins A, et al. Topical imiquimod in conjunction with Nd:YAG laser for tattoo removal. Lasers Med Sci 2009;24:871-5. Ricotti CA, Colaco SM, Shamma HN, Trevino J, Palmer G, Heaphy MR Jr. Laser-assisted tattoo removal with topical 5% imiquimod cream. Dermatol Surg 2007;33:1082-91. Genina EA, Bashkatov AN, Tuchin VV, Altshuler GB, Yaroslavski IV. Possibility of increasing the efficiency of laser-induced tattoo removal by optical skin clearing. Quantum Elec 2008;38:580. Luebberding S, Alexiades-Armenakas M. New tattoo approaches in dermatology. Dermatol Clin 2014;32:91-6. Brauer JA, Reddy KK, Anolik R, Weiss ET, Karen JK, Hale EK, et al. 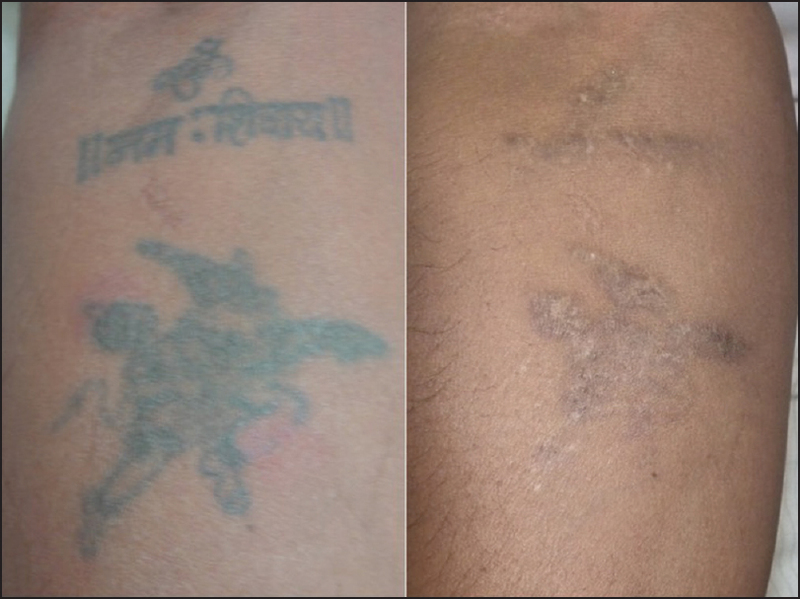 Successful and rapid treatment of blue and green tattoo pigment with a novel picosecond laser. Arch Dermatol 2012;148:820-3. Saedi N, Metelitsa A, Petrell K, Arndt KA, Dover JS. 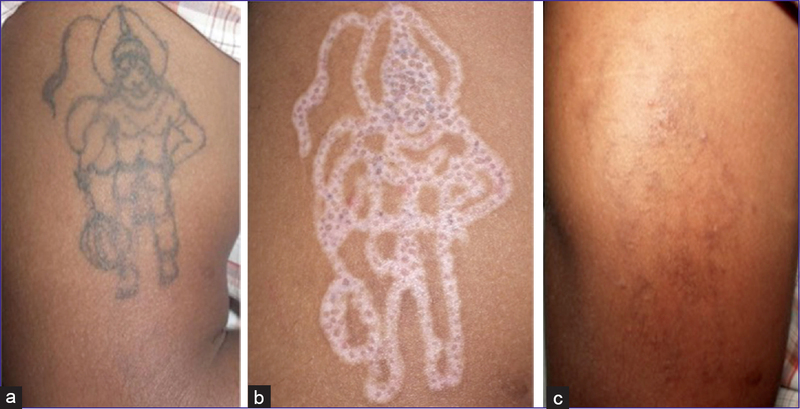 Treatment of tattoos with a picosecond alexandrite laser : A prospective trial. Arch Dermatol 2012;148:1360-3. Au S, Liolios AM, Goldman MP. Analysis of incidence of bulla formation after tattoo treatment using the combination of the picosecond Alexandrite laser and fractionated CO2 ablation. Dermatol Surg 2015;41:242-5. Weiss ET, Geronemus RG. Combining fractional resurfacing with Q-S ruby laser for tattoos. Dermatol Surg 2010;36:1-3. Marini L, Kozarev J, Grad L, Jezersek M, Cencic B. Fractional Er:YAG skin conditioning for enhanced efficacy for Nd:YAG Q switched laser tattoo removal. J Laser Health Acad 2012;1:35-40.